Sultan, The Jungle Book, Airlift, Housefull 3, Baaghi, Neerja and Kapoor & Sons – one look at the list of films that have turned out to be successful in 2016 and it is crystal clear that the ones which went on to win support from audiences were those that were clean entertainers. Other than the fact that none of these films has been an ‘A’ certificate affair, there is also nothing in there which is cringe-worthy. Now that Dishoom is set for release, the sentiment across the industry is unanimous that yet again, it is clean entertainment, courtesy producers Sajid Nadiadwala and Sunil Lulla, along with director Rohit Dhawan’s family audience appeal, which would make Dishoom a good choice for the cine-goers. “Whether it is universal successes like Sultan, The Jungle Book, Housefull 3 and Baaghi or niche biggies like Airlift, Neerja and Kapoor & Sons, what ties them all is the fact that each of these can be seen sans any inhibition. You don’t have any issues pertaining to filthy language or the kind of on-your-face item songs that would make a section of audience uncomfortable,” comments an observer. Since Sajid and Sunil too believe in such brand of universal entertainment, the results are apparent in Dishoom as well which belongs to action comedy genre and is catering to audiences from 6 to 60. 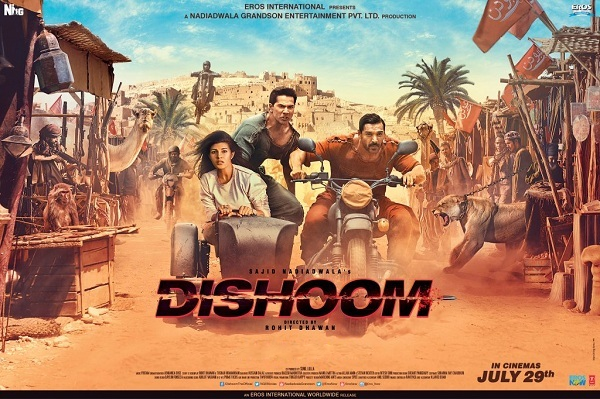 Moreover, with Jacqueline Fernandez carrying a massive appeal amongst youth and Akshaye Khanna bringing back good nostalgia for audiences who have been following him for almost two decades now, Dishoom is indeed turning out to be a hot property en route its 29th July release.